There are many endangered animals in Africa today, and the reason for the diminishing of such African animals ranges from poaching and loss of habitat and a host of other human factors that come in the form of deforestation and displacement have contributed to these animals in Africa facing a very high risk of extinction. Displacement can destroy a species quicker than so many other disturbing factors. In a bid to conserve the threatened animal species, many nations have implemented laws offering protection to conservation reliant species. Untamed human factor has resulted in quite a lot of endangered animals in Africa and among the most affected include the list below. The African elephant is among the most endangered animals in Africa. There are approximately a little over 600,000 African elephants accounted for, they are on the endangered animals list due to poaching and loss of habitat which nearly pushed these animals to the point of extinction. The African elephant, aka Savanna Elephant, is the largest living terrestrial mammal in the world. They usually travel in groups or family units and they live off of a diet of shrubs, fruits, branches, shoots and leaves. There are a little less than 72,000 African Penguins living today. The decreasing numbers are due to commercial fisheries, penguins getting caught up in nets, and oil spills. The African Penguin, aka black-footed penguin, and jackass penguin, is the only penguin that breeds in Africa. These penguins diet on anchovies and sardines. A fully grown African penguin stands two feet above the ground and is highly social without difficulty in engaging with other creatures and human beings alike. There are a little over 22,000 African Lions accounted for and their numbers have dwindled due to poisonings, hunting and loss of habitat. The African Lion, aka “King of the Beast”, is a very social animal. The female lions congregate in prides and the men form coalitions. The females do most of the hunting at night to avoid disturbance from other animals. Nearly 14,000 cheetahs exist today as a result of loss habitat and human interference. The Cheetah is known as the fastest land mammal in the world and can achieve blazing speeds of up to 113km/hr accelerating from 0 to 100km/h in just 3 seconds. They are very social, and the male cheetahs form groups while the females remain loners. The cheetah hunts for their prey during the daytime hours. There are only a little over 3,500 black rhino’s accounted for today. This staggering number is due to poaching of these wonderful animals for their horns. The Black rhinoceros is a solitary loner, they do not usually travel in groups. They dine on twigs, plants and herbs and bathe in the water and mud to stay cool during the summer months. The African western black rhino was officially declared extinct in 2011 after a review of plants and animals by the world’s largest conservation network. The subspecies of the black rhino — which is classified as “critically endangered” by the International Union for Conservation of Nature’s (IUCN) Red List of Threatened Species — was last seen in western Africa in 2006. 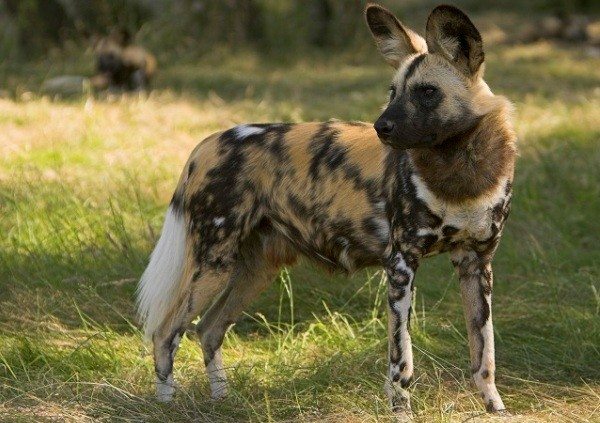 The African Wild Dog is counted at slightly over 4,000, This very small number is a result of disease, and human interference which includes hunting them for meat. The African Wild Dog, aka Cape hunting dog and the painted hunting dog, is very social. They travel in packs, and hunt prey in groups which could be up to 20 members. The average African wild dog weighs between 37 and 80 pounds and measures 24 to 30 inches high. In the Convention on International Trade in Endangered Species of Wild Fauna and Flora which was an international treaty signed by over 144 member countries indicates that the species cannot be traded commercially but can be traded commercially only if it does not harm their survival. These adorable little hippos are dwindling into the mere 1500’s at this time in the world. The horrible numbers for this species is due to deforestation, and hunting. This river horse stays in the water in the daytime and eats at night. Their diet consist of grass, roots, leaves and fruit. Despite being a large mammal, the Pygmy Hippopotamus is an elusive and rarely seen species. The Pygmy Hippo is a symbol of the forests of West Africa – the hippos’ fate is intrinsically linked to that of the forest. The mountain gorillas are among the most endangered African animals and only live in three countries spanning within four national parks—Volcanoes National Park, Mgahinga Gorilla National Park, Bwindi Impenetrable National Park and Virunga National Park. Due to a destroyed habitat, poaching and trade this mountain Gorilla’s numbers are way down in the 650 range. Mountain Gorillas live in altitudes as high as 4000 meters, and they diet on leaves, plants, trees, etc. They are true herbivores. A recent census done in 2011 recorded fewer than 900 mountain gorillas left in the wild. The biggest threats to the existence of these mountain girillas come from deforestation and development and as people move closer to infringe on the habitats where gorillas live, they also bring the risk of spreading human diseases to these animals including flu, pneumonia, and even Ebola. As a result of a severe decline in their habitat and disease there are slightly a little more than 400 Ethiopian Wolves accounted for. The Ethiopian Wolf, aka- Abyssinian Wolf, and the Simien fox or jackal, is the only wolf species found in Africa. The features of this animal are very similar to the features of the coyote. They travel in packs and they diet mainly on several species of grass rats. The Addax is the most endangered animal in the 10 most endangered animals in Africa. Its numbers are constantly decreased due to hunting and drought. Their numbers today are at a little over just 200. The Addax, aka White Antelope, and the Screwhorn Antelope, dwells in the desert, in herds led by males. They are nomad creatures who travel during the night. Their diet consist of grass and herbs.